peel or cucumber-embedded ice cubes. Photo © Liv Friis-larsen | Fotolia. 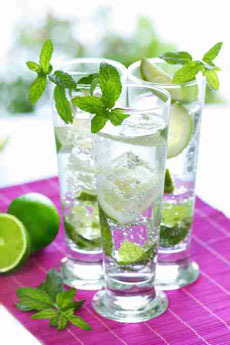 Make your ice cubes a focus of attention by freezing fruit, herbs or small vegetables in the cubes. For sweet drinks, add a raspberry, small strawberry, red grape, mint leaf or lemon peel curl to each section of the ice cube tray. For savory drinks like Bloody Marys, use a grape tomato, small basil leaves or a snip of rosemary. For ice water, quartered cucumbers (leave the peel for color), mint and lemon curls are pretty. Check out our favorite ice cube trays from iSi Orka. Plan a fancy cocktail party with recipes from the Cocktails & Spirits section of THE NIBBLE online magazine.